Memory Foam vs. Latex Compared - Which Material is Right For You? Home » Buyer's Guide » Memory Foam vs. Latex Compared – Which is Better for You? Have you been hearing a bunch of information about the latest in mattress innovations, but have been unable to determine what’s true and what’s not? So many manufacturers and salespeople are throwing around terms like memory foam and latex to describe their products and their respective benefits, and it’s time to put the myths and misconceptions to rest! We’ve put together a summary that dives into these terms to get to the heart of their likenesses and differences so that you can finally understand the difference between memory foam (our recommended brands) and latex mattresses (see our top latex picks). We’ll also discuss how you could benefit from having a mattress made from either material or both materials if you so choose! You’ve probably heard by now that memory foam was first utilized in the 1960’s by NASA. According to Web MD, the brilliant people at NASA employed it for protecting their pilots during crashes. This material was specifically chosen for a few clear reasons that we’ll discuss. But first, what is it? The easy answer is that it is a polyurethane that has been designed with many different chemicals. These chemicals lead to the result of a material that is exceedingly dense and energy absorbing. We go in-depth about how memory foam works in this article. But for this discussion, all you need to know is that this type of foam adjusts to the exact shape of your body. With memory foam, there is noticeably slow recovery time. Meaning, when you press your body into the material and lift it up, you will not see the material resume its original form very quickly. This fact lends to its comfortability and support when it's added to upper layers. Manufacturers recognized the fantastic benefits this material can bring to people who suffer from back or joint pain, and most top mattress brands use some type of foam in their beds. Latex is in contrast to memory foam, in that it has an especially fast recovery time and a lot more bounce. If you press your hand into a bed made with latex and then lift your hand up, the mattress will resume its original shape very quickly. There are a couple of different types of latex that are used for mattresses. The first is natural latex. This type comes from rubber trees and is the purest form of its kind. It can be very economically made and is the ideal choice for someone who wants an all-natural option. Another option is synthetic latex. This type is a different kind of rubber that is constructed using many different synthetic materials. For users of synthetic latex bed the most notable difference between synthetic and pure latex mattress, as that the synthetic version tends to have less bounce, and can feel more akin to that of a memory foam option. Additionally, there are two other subcategories of latex mattresses. We will briefly discuss these two types and their associated benefits. The main difference between the two is that the Talalay is known to be a lighter version and consists of more air in the material. Conversely, the Dunlop is known for being the denser of the two, and thus it is much heavier. Overall, the Talalay option is most preferred for a couple of reasons. First, it’s typically ideal for your mattress to be lighter. This makes transporting it easier. Second, that fact that it can hold more air means that it will remain cooler throughout the night. This is ideal for any sleeper that can’t stand to sleep in a hot bed. One of the main reasons to employ the Dunlop option instead is that, over time, it tends to keep its shape and last a long while. Because of its density, beds that employ Dunlop tend to avoid sagging over time and also tend to be more durable. The major difference between memory foam and latex mattresses is how they conform to your body. Memory foam options will conform to the exact shape of each individual. The latex option, however, will compress and bounce, and will only conform to the general impressions that your body makes. Whichever of these options you prefer depends on your personal preference and your sleep needs. Another stark contrast between the memory foam and the latex mattresses is their ability to isolate motion. Memory foam does not allow for motion transfer. Meaning, if your partner is sleeping on the other side of the bed and frequently moves around during the night, it is likely that you will hardly feel it, if at all. This is why it's preferred by couples. Latex, on the other hand, does not isolate motion nearly as well. During the night, in the same situation, you will absolutely feel your partner tossing and turning during the night, because latex has a quick response time and is very bouncy. The main likeness shared between these choices is that they both provide posture support. Being that they both conform in some way to the shape of your body, pressure relief is supplied to the spine, neck, and joints. Other than that, these options are quite different regarding motion transfer and energy absorption. When you’re trying to decide between a memory foam mattress and a latex mattress, it all depends on what benefits you’re hoping to receive. Both of these types of bed serve a purpose and are a good fit for certain kinds of sleepers. Memory foam is a great option for many sleepers for several reasons. We’ve outlined just a few to provide you with a firm understanding of the many benefits associated with this mattress option. The first reason to pick this material over any other is if you are a back sleeper. If you are sleeping on your back, then it is essential that you choose the mattress that is going to provide you adequate spinal and neck bone alignment. Foam contours to the unique shape of your body, it is ideal for allowing your neck and spine to reach a comfortable and healthy level of optimal alignment. If you are a side sleeper, this is true for you as well. Like with all sleepers, the ultimate goal is to make sure that your spine is correctly aligned to avoid and neck or joint discomfort when you wake up. For side sleepers, it’s also essential to pay attention to the comfort of your hip joints. 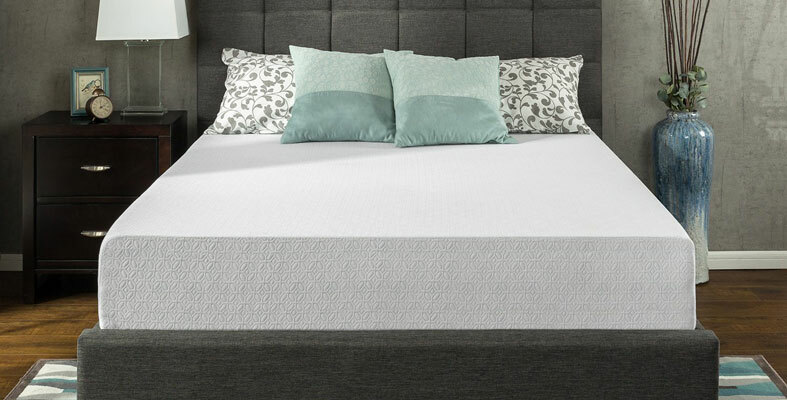 Memory foam provides the unique benefit of both, aligning the spine and neck during your sleep, and providing support and comfort for the hip and shoulder bones that press into the bed during the night. We have now discussed back and side sleepers, but the truth is that all sleepers enjoy the comfortability that comes with sleeping on a bed that can take on the shape of your exact body type. This is no surprise. What’s more, is that, if you sleep next to a partner each night, both of you will find comfort and will rest easy. There are two reasons for this: The first reason is that the bed will contour to each of you independently. The second reason is that, if the other person is moving throughout the night, you’re not likely to feel it. For those who are not able to get out of bed, or for those who are sick in a hospital, this option is well suited to relieve the pains of not being able to get up. Patients often experience this when they can’t get out of bed, that the lack of circulation to the skin tissue and gravity and friction that is continually being detrimental to the body will take a toll, and be very painful. The painful parts of the skin that are constantly pressed against the bed are known as a bed sore, or a pressure ulcer, according to the Mayo Clinic. The mattresses made out of this material have the unique ability to fight off these painful sores, because of its ability to contour perfectly to every part of the body. Memory foam is known for being one of the most hypoallergenic options on the market today. Anyone who experiences issues with different fabric allergies, such as with wool or any other fibers, this is an excellent choice for you. Because the bed is so dense, it is far less likely that dust mites will be able to thrive in its material, and the material is less liable to hang on to dirt or bacteria. Why Say “No” to Memory Foam? One of the very few reasons why you wouldn’t want to choose a memory foam bed is that this option is known to retain heat. If you are a person that requires a cooling mattress to sleep on, then this may not be the best choice for you. While manufacturers are consistently attempting to mitigate this issue, it’s unclear as of yet, whether or not they have succeeded in creating a cooling foam option. If you’re a stomach sleeper, you may experience discomfort while sleeping on a memory foam mattress. You may be well aware, that we at The Sleep Advisor are strong advocates against sleeping on your stomach. It can cause many health issues. That said, it’s important to note that these mattresses do not supply enough give to assist in aligning the spine properly when you’re sleeping on your back. Because this mattress is so firm, there isn’t a whole lot of “give,” which is necessary to align your spine and neck bones when you are on your stomach. Lastly, memory foam mattresses, much like their competitor, the latex beds, are known for having a strange smell when you first open it up and take it out of the box. This is because of something Web MD refers to as “off-gassing”. According to the Merriam-Webster dictionary, off-gassing is a term used to describe the emission of, especially noxious gases. These gases can initially be harmful, especially for children who are exposed. As such, it’s best to let your bed air out for a few days before sleeping on it. Or if you’re worried about this gas exposure, then choosing a more traditional type of bed may be your best bet. There are many reasons why it might be best for you to choose latex as your bed material. As we did with memory foam, we will just get into a few general reasons so that you can make the best decision for you. One of the main reasons that individuals decide to go with this option is because they can be the most natural and best for the environment. As we previously learned, natural latex beds come straight from rubber trees, rather than mixing up a bunch of questionable chemicals. It is important to note that not all of these mattresses are natural or are made from pure rubber trees. The synthetic options have many chemicals in them that serve to change the overall feel of the bed. If you are most interested in being environmentally friendly, make sure you know the origin and components of your bed, as well as the chemicals used to make it. There are varying degrees of firmness when it comes to latex, and what you choose depends on the level of firmness you prefer. However, in general, these beds are known for being firmer when compared to more traditional types of mattresses. When picking the bed that’s perfect for you, be sure to inquire as to the different levels of firmness. Many beds employ different layering systems as well, that adds to the feel of the bed. To ensure that you are getting exactly what you want, make sure to know what each layer is made of and the reasoning behind each layer. According to Dr. Michael Breus, author of Beauty Sleep: Look Younger, Lose Weight, and Feel Great Through Better Sleep, latex beds are one of the most comfortable options on the market. He also discusses in a Web MD article how these beds provide an excellent combination of support and comfort. If you are someone who requires a cooler mattress, this material may be a good option for you. 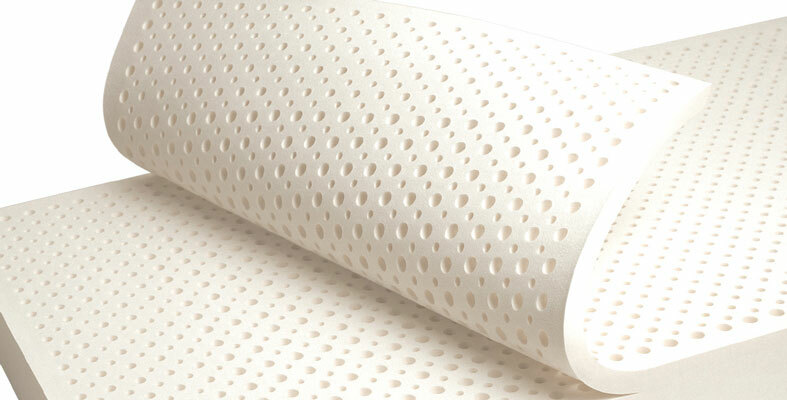 If you’ve never seen what a latex mattress looks like, you’d be surprised to find that they all have holes punched into them. These holes are to allow for air to flow through them and provide air circulation. So, unlike memory foam, this bed keeps cool during the night while you’re sleeping on it. The holes also make this type of bed more resistant to mold and bacteria growth over time. No need for cooling pads, in this case, and it's preferred if you live in a hot environment. Why Say “No” to Latex? There are just a few reasons why a latex bed might not be suitable for your needs. The first reason is that they can be relatively expensive.However, due to their durability and longevity, you may find that over time, being that you won’t have to buy a new bed for decades that this may end up being affordable after all. The second reason why you may wish to pick another type of bed is that these mattresses are known for having a horrible smell, especially when you first open them up from their packaging. While it does tend to go away over time, it is known to last a few weeks at least. The third reason is that some people are allergic to latex. It’s true that only a small amount of the population are allergic to this material. However, it is still important to point out. If there is a possibility that you or your partner are allergic, then it may be best to find another suitable option. Overall, both of these material types can be enjoyable for many different types of sleepers. Deciding what’s right for you is dependent on several factors. Do you prefer to sleep on a firm and energy absorbing bed? Do you regularly sleep on your back or your side and are concerned with spinal alignment and avoiding joint stiffness? Then, it’s likely that you would receive many benefits from choosing memory foam. Are you someone who is concerned about the environment and wants to pick a bed that is natural? Are you someone who’s trying to find the delicate balance between a cool nights sleep, comfort, and support? If you’ve answered yes to these questions, then you might just find a latex bed to be exactly what you’ve been looking for. 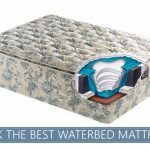 There are many resources out there that are aimed at helping you get it right the first time, and choosing a mattress that best fits your unique sleep needs. Making that decision ultimately depends on which benefits you hope to see the most. I’ve used memory foam for years. Lately I’ve found my particular beds bit too soft. What do you think of a memory foam/ latex hybrid, with the latex providing the top layer? Hi Steven! 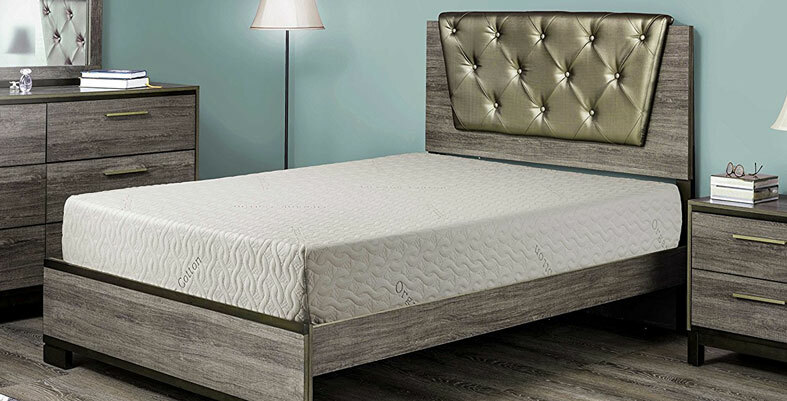 Latex on the top could possibly give you a little more ease when you’re repositioning, but you won’t have the same slow sinking sensation you probably are familiar with when it comes to classic memory foam. The best way to find out what’s best is to try it, and good news that a lot of these companies have sleep trials so there’s little risk!! Thanks for reaching out. Hmm. Well, Karen, it seems that you might be experiencing excess sinkage around your hips, which is common since we all seem to carry a little extra weight in this region. If you’re interested in foam, there are several options you could buy that have zoning included that will provide a little extra support in the middle of the mattress to address this issue. Thanks for reaching out! I am having the same sink hole issue but am not carrying extra baggage. In fact I could use some extra there, any tips on how to prevent this plus which type would work better would be very helpful. Information on on the different zoning one can buy also please? I am not sure how to even locate such options. Thank you. Hi Lisa! Many brands feature zoning and many are right here on our website! A list of beds with zoning is a great idea, and I’ll start putting one together. Latex on top will provide a slightly different feel. A bit less conformance, but a bit more responsive, depending on the brand and firmness that you select. I’d have to know more about the memory foam and latex in question, but it may be slightly easier to move around on the latex and you might experience a touch more bounce. Also the latex might sleep a touch cooler, but again, that depends on how the memory foam is treated. Either should provide the pressure relief you’re looking for. Just make sure that you’re not adding so much “comfort” that you’re sacrificing the benefit of the bed’s support system. As a side sleeper, I don’t think this should be an issue.